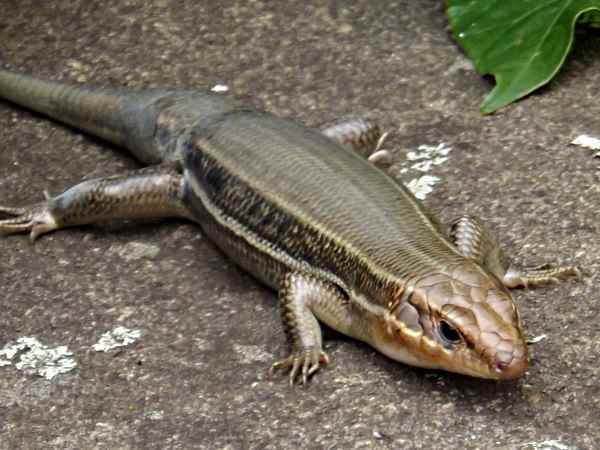 Skinks are usually grouped in a single family, Scincidae (1,579 species) representing one-quarter of all lizard species. Other large lizard families, such as Gekkonidae (s.l.) and Iguanidae (s.l. ), have been partitioned into multiple families in recent years, based mainly on evidence from molecular phylogenies. 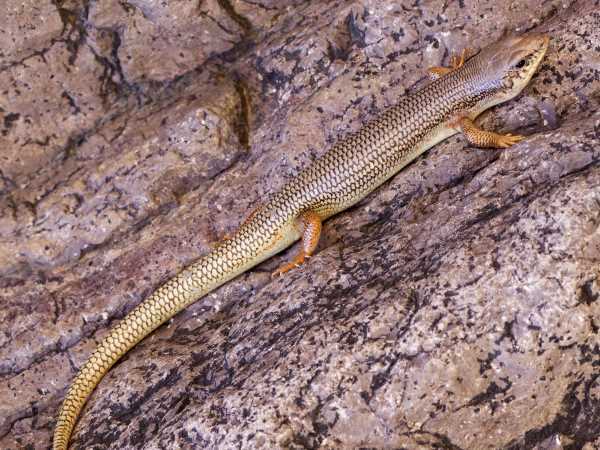 Subfamilies and informal suprageneric groups have been used for skinks, defined by morphological traits and supported increasingly by molecular phylogenies. Recently, a sevenfamily classification for skinks was proposed to replace that largely informal classification, create more manageable taxa, and faciliate systematic research on skinks. 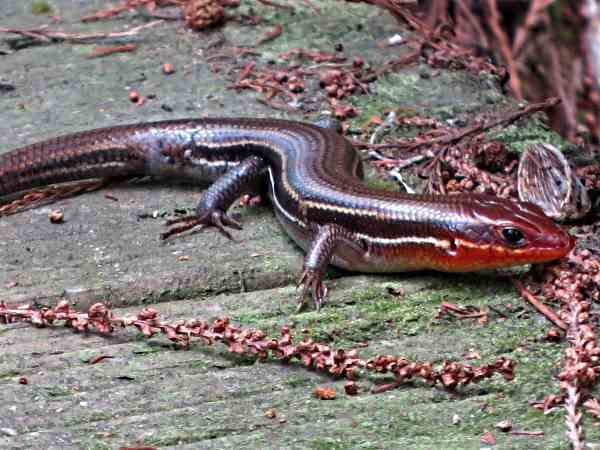 The fifteen native skink species constitute a small portion of North American lizards. Thirteen of the one hundred and twenty two lizard species, or about twelve per cent, belong to Skinks family (Scincidae). There are many subspecies with the Southeastern Mole Skinks having five. The common name mole refers to their behavior of burying underground. Coal Skinks get their name from the place where they were first discovered, the anthracite coal regions of Pennsylvania. Actually, they can be found up and down the Applachian Mountains, including Georgia. There’s also a different subspecies with a Midwest range that extends to Texas. Typically they get characterized as medium sized lizards with smooth skin. The picture at the top of the page shows a Broad-headed Skink. With the exception of New England, it’s common in the Midwest and East. Identifying them can be fairly easy. In the east, they are cited as the largest lizards, growing over a foot in length. They live in trees, so seeing a large, smooth skinned lizard in the tree is often a good identificaton starting point. The pictures on this page provide a description of a representative sample of skinks. 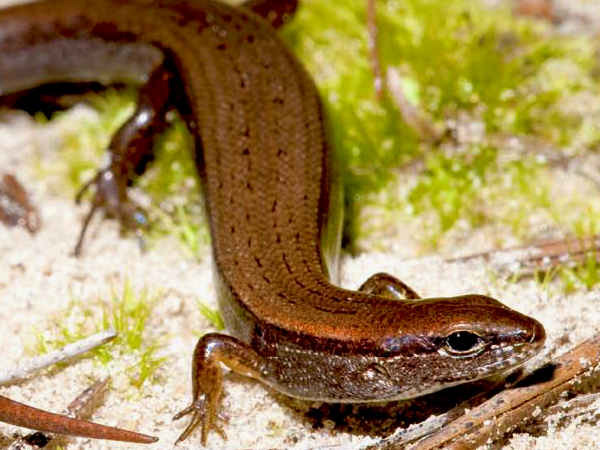 It starts with the Ground Skink Scincella lateralis, the only member of the genera in the United States. They spend their time on the ground among the leaf litter in search of insects. Finding one might be as easy as kicking over the leaf litter (gently) during the spring season, when they are emerging from hibernation. Western Skinks, like many skinks tend to live near water areas near forests and grasslands. There is no stripe down the middle of the back. 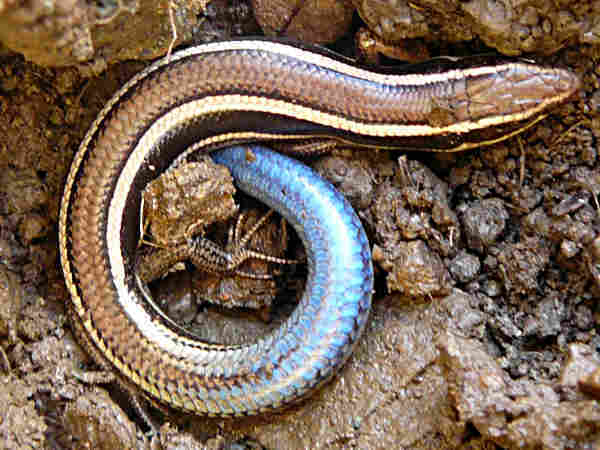 The tail turns blue and can be detached if the skink feels threatened. Southeastern Fives-lined Skinks (Plestiodon inexpectatus) look very similar to the common five lined skinks. By definition, there will be five lines along the body, including on down the middle of the body. The tail will be blue. They can grow up to eight inches in length and live in wooded areas. Last, but certainly not least, The Great Plains Skink receives the title of the largest skink in the United States. They can measure in at about fourteen inches in length, including the tail. They live in underground burrows and come out during the day to forage for food. The picture shows a spotted skink, unlike any others on this page. Once discovered, they are easy to identify.